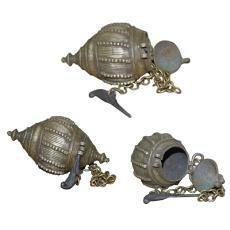 Brass Lime Paste/ Powder Box comes in 12 x 6.5 cm size. The Box is offered in shell-like shape. The Brass Lime Paste/ Powder Box has nice finishing. Comes in 12 X 6.5 cm size.